Jared Kushner, President Donald Trump’s son-in-law and top White House adviser, was willing to go extraordinary lengths to establish a secret line of communication between the Trump administration and Russian government officials, The Washington Post reported on Friday. 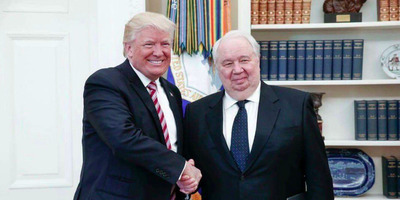 During the presidential transition period leading up to Trump’s inauguration, Kushner held a series of meetings with the Russian ambassador to the US, Sergey Kislyak, and the head of a Moscow bank that was under US sanctions. In talks with Kislyak in December, Kushner floated the possibility of setting up a secure line of communication between the Trump transition team and Russia — and having those talks take place in Russian diplomatic facilities in the US, essentially concealing their interactions from US government scrutiny, The Post wrote, citing US intelligence officials briefed on the matter. Kislyak reportedly passed along that request to Moscow. The Post’s Ellen Nakashima, Adam Entous, and Greg Miller reported that the Russian ambassador was “taken aback” by Kushner’s request, because it posed significant risks for both the Trump team and the Kremlin. Kushner, who did not disclose the meeting on his security clearance form, is now a subject in the FBI’s investigation of Russia’s election interference, and whether the Trump campaign colluded with Moscow to undermine Hillary Clinton. “GOOD GRIEF. This is serious,” said Bob Deitz, a veteran of the NSA and the CIA who worked under the Clinton and Bush administrations. Kushner did not previously disclose the December meetings to US officials during his background check, and the White House only acknowledged them after news outlets reported on it. It follows a pattern among key Trump advisers that unfolded during and after the 2016 election. “If Jared Kushner was trying to set up a back channel with the Russians, doesn’t that mean he wasn’t colluding with them?” a White House official said in response to the story, according to CNN. But Kislyak and the Trump campaign interacted extensively, and Trump associates either kept those interactions secret from US officials or misrepresented them, as was the case with Michael Flynn, who was forced to resign in February for similar reasons. “We know about the multiple meetings of Trump entourage members with Russian intel-related individuals,” Carle said. “There will be many others that we do not know about.” He noted that while this reported back channel is “explosive,” it is worth questioning who planted the story — The Post reportedly received an anonymous letter in December tipping them off to the Kushner-Kislyak meeting. Russian EmbassyPresident Donald Trump meets with Russian Ambassador Sergei Kislyak. Additionally, as a longtime diplomat, Kislyak would have known that his communications were being monitored. So the possibility remains, Carle said, that the Russians used the meeting with Kushner to distract the intelligence community and the public from potentially more incriminating relationships between the campaign and Moscow. Indeed, Kushner also met with the CEO of Russia’s state-owned Vnesheconombank, Sergey Gorkov, in December 2016, The New York Times reported in late March. The meeting — which had not previously been disclosed and came on the heels of Kushner’s meeting with Kislyak at Trump Tower — caught the eye of the Senate Intelligence Committee, which is investigating Russia’s interference in the 2016 election and whether any members of Trump’s campaign were complicit. Kislyak reportedly orchestrated the meeting between Kushner and Gorkov, who was appointed by Russian President Vladimir Putin in January 2016 as part of a restructuring of the bank’s management team, Bloomberg reported last year. The Kremlin and the White House have provided conflicting explanations for why Kushner met with Gorkov. Former CIA Director John Brennan, in testimony Tuesday before the House Intelligence Committee, said that he was concerned by some of the “interactions” between Russian officials and members of the Trump campaign that took place during the election last year. Republican Rep. Tom Rooney asked Brennan if he ever found “any direct evidence of collusion between the Trump campaign and Putin in Moscow” while he was the CIA director. Brennan replied that “there was intelligence that the Russian intelligence services were actively involved in this effort … to try to get individuals to act on their behalf either wittingly or unwittingly.” He added that he was “worried by the contacts that the Russians were having with US persons” and “had unresolved questions” by the time he left office about whether” the Russians had succeeded in getting Americans to do their bidding.